In the twentieth century, pioneers of plasma cosmology began to identify the crucial role of electric currents in interstellar and intergalactic space. The “electric universe” hypothesis extends plasma cosmology into domains that were, at best, only partially touched by its pioneers. This paper will present a brief summary of the “electric Sun,” a core theme of the electric universe. Additionally, we will offer pointers to the recent interdisciplinary contributions of others toward a new understanding of electricity in space. The theoretical understanding of the Sun and its domain has always reflected various ideas about events on a larger scale, such as the formation of galaxies and planetary nebulas. Conversely, as we learn more about the Sun, this knowledge has the potential to challenge longstanding ideas about the universe as a whole. For well over a century the commonly accepted view amongst astronomers and cosmologists was categorical: gravity is king. Gravity rules the heavens. It is the ultimate driver behind the evolution of galaxies and stars. Though this core dogma grew more complicated with the advent of relativity theory, then more complicated still by a continuous stream of space age surprises, gravity remained supreme. It is the weakest of the fundamental forces known to science, but the prior theoretical “consensus” continued to treat gravity as the only fundamental force capable of acting across cosmological distances. By contrast, the hypothesis reviewed here proposes that the electric force plays a more significant role in the cosmos than was ever recognized under the standard theories of 20th-century astronomy. We now know that space is not empty, but filled with charged particles, a sea of conductive plasma, albeit extremely rarefied. Rapidly accumulating evidence suggests that electric currents flow across intergalactic, interstellar, and interplanetary space, contributing directly—often decisively—to the evolution of cosmic structure. As today’s theorists come to acknowledge this role, the picture of space will be forever changed. The emerging electrical perspective sees an integral connection of stars and galaxies to their external environments. As observation began to reveal unexpectedly high and strongly focused energies in space, prior theory required that the motor come from inside the observed structures, initiated either directly or indirectly by gravity. That requirement, in turn, could only dissuade cosmologists from asking the most fundamental question: is it possible that external electric currents, powered by the stored charge in deep space, could drive much of the observed structural evolution? Given our proximity to the Sun and the immanent opportunity to take electrical measurements close to the dynamic activity of the Sun, perhaps no subject offers a more complete window to the roles of plasma and associated electric currents in space. What will the results be for our thinking about the more remote cosmic expanse? The 20th century brought numerous advances in our knowledge of charged particles in the “vacuum” of space. As new telescopes and probes extended the frontiers of human knowledge, space came alive with electromagnetic activity. Technicians and engineers of the space age delivered to the theoretical sciences all the evidence needed to confirm the existence of electric currents and of the magnetic fields these currents produce across the farthest reaches of space. When currents flow in space plasma, the magnetic fields produced will tend to confine the flow to narrow, twisting filaments, known as plasma z-pinches. That is what we now observe filling the “vacuum” of space, as Alfvén himself had predicted. More intense focusing of this current flow will often generate explosive electric discharge, and the consequent electromagnetic radiation can include—at the highest energies—“synchrotron” radiation, now abundantly observed in space. Intense electric fields remain the only plausible explanation. But when Alfvén predicted galactic synchrotron radiation, astronomers did not respond. Electric fields in space had not yet entered their lexicon. Alfvén’s lifelong experimental work laid the foundations for a new approach to galaxy formation. Galaxies are often dwarfed by the full extent of electromagnetic radiation in their surroundings, and the source of these energies must be taken into account. In the plasma universe, electric currents will intersect at critical points to drive an electric vortex, giving birth to spiral galaxies. This envisioned behavior of electricity in space is based on the laboratory observation of electric currents and electric discharge in plasma, together with supercomputer simulations of the way charged particles interact under the influence of electric currents. This model was elaborated by one of Alfvén’s long-standing students and collaborators, the leading plasma scientist Anthony Peratt in 1986. An expert on high-energy plasma instabilities and author of The Plasma Universe,  Peratt used a super computer to simulate the behavior of a cloud of charge (a particle-in-cell simulation) illustrating the manner in which electric currents in plasma will generate the familiar shape of spiral galaxies and of other galactic structures. Based on diligent laboratory work spanning decades, Alfvén developed a model of galactic circuits in which electric currents flow inward along the arms of galaxies, generating an encircling magnetic field. On reaching the galactic center, the electric charge that drives these currents is stored in a compact electromagnetic plasmoid—a rotating torus or donut-shaped structure episodically releasing its stored energy as jets along the galaxy’s spin axis. 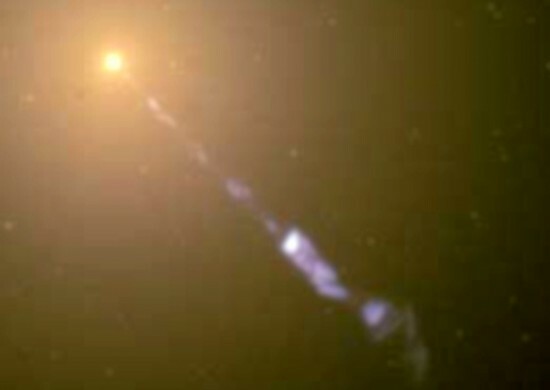 Alfvén concluded that this is how an “active galactic nucleus” (AGN) is born. From this vantage point, the electrical behavior of the galactic plasmoid, though often hidden by dust, is the confirmation of immense electric potential. Moreover, in this radical break from earlier theory, the newborn galaxies could in fact be lit by electric lights—the stars strung along galactic filaments as witnesses to interstellar power lines or current streams. Fig. 3. The galaxy 3C31, depicted on the right, appears as a mere speck within the energetic radio signals that surround it (left). 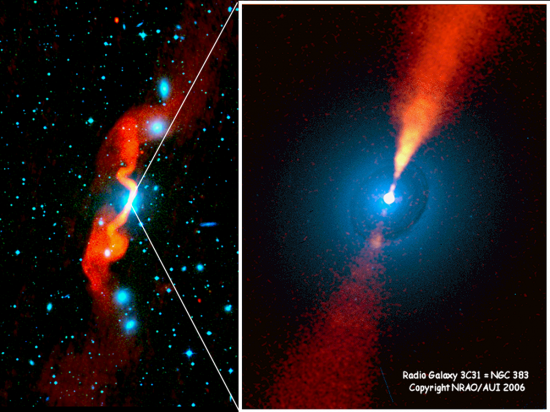 Credit NRAO/AUI 2006. Could the plasma universe also open a door to a more accurate picture of the Sun? By the middle of the 20th century, astronomers had fully settled on one idea: a nuclear furnace at the Sun’s core. Prior to the emergence of the fusion model, a “consensus” theory had survived for a hundred years. Early in the 19th century, Sir William Herschel argued that the heat and light of the Sun were due to gravitational collapse of a primordial nebular cloud. Textbooks described the theory as a crowning achievement. “As a scientific conception it is perhaps the grandest that has ever entered into the human mind,” wrote Edward Holden in 1881. A few decades later the theory lost its credibility as astronomers realized it could not account for the emerging billion-year scenarios of Earth evolution. But now a radically new view is possible. Could the Sun’s light and its entire range of electromagnetic activity be partly or entirely due to the flow of electric currents into and through the heliosphere? The ”electric Sun” hypothesis challenges the assumption of a solar nuclear furnace, and its roots reach as deep into intellectual history as those of the nuclear model Yet you will not see it mentioned in any standard astronomy text. Fig. 4. Is this eruption of the Sun due exclusively to a power source at the Sun’s core? Or is the Sun responding to a vastly larger electrical environment? Credit: SOHO (ESA & NASA). For historical perspective it’s important to see the electric Sun as a logical extension of the “plasma universe” formulated by Alfvén and his students and colleagues, such as Anthony Peratt. The work of others fed into the present concept as well. In the 1960s, Bruce’s work inspired a U.S. engineer, Ralph Juergens, to undertake an independent investigation of the Sun. Over the following decade, Juergens published a series of articles contending that the thermonuclear model “is contradicted by nearly every observable aspect of the Sun.” His answer to these contradictions was to suggest that the Sun is the focus of a galaxy-powered “glow discharge.”  With this, Juergens was effectively the first to argue that the Sun is actually powered by electricity rather than nuclear fusion. Juergens’ work had a profound effect on those who considered it most closely. One was the late Earl Milton, professor of physics at Lethbridge University in Canada, who devoted several years to exploring an electric model of the Sun. Around the same time, Australian physicist Wallace Thornhill also found inspiration in Juergens’ hypothesis, coining the phrase the “Electric Universe” in the mid-nineties. Thornhill has since devoted much of his life to researching this new paradigm and the core tenet of an electric Sun. The work of Thornhill and his colleagues led to a broad interdisciplinary synthesis attracting researchers from around the world. One such researcher was retired professor of electrical engineering, Donald Scott, author of the recently published book, The Electric Sky. A centerpiece of the book is the electric Sun hypothesis. Is it possible that unsolved mysteries of star formation find a unified explanation close to home, in the hypothesis of an electric Sun? The concept would extend the plasma universe to the observed features of individual stars. From this perspective, electric currents flowing along galactic arms are pinched into focal points of star formation (the z-pinch effect). Stars can then be seen in an electrical connection to the stored energies of the plasma oceans through which galaxies and galactic clusters move. Fig. 5. Geissler tube. 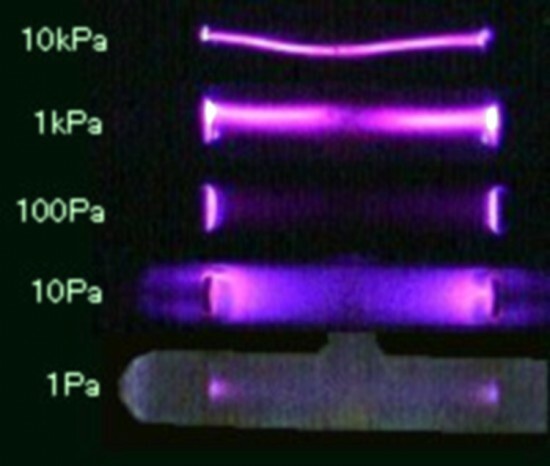 As pressure is reduced within the glass tube, changes occur in the glow discharge. The electrical hypothesis envisions the Sun immersed in a medium of extremely low-density plasma. Its glow discharge is similar to that of a Geissler tube. Only very close to the Sun will the concentration of atoms be sufficient to excite them to emit visible light. We see that light as the photosphere and the corona, but the “atmosphere” of the Sun extends outward as the plasma medium through which the planets move, all affected by heliospheric currents, the invisible movement of charge. Together with the Sun itself, electrical activity within the heliosphere and beyond provides a laboratory in space for evaluating the electric Sun hypothesis. Since the hypothesis suggests electric currents flowing into the heliosphere, the investigation must consider all evidence bearing on this possibility, from the behavior of the Sun’s visible surface and corona to Earth’s auroras; from the worlds of Jupiter and Saturn out to the boundary of the heliosphere, the presumed limit of the Sun’s influence. It must extend also to the galactic neighborhood, where currents flow along galactic arms. And it must even reach beyond the Milky Way to the unfathomable power now evident in intergalactic space. 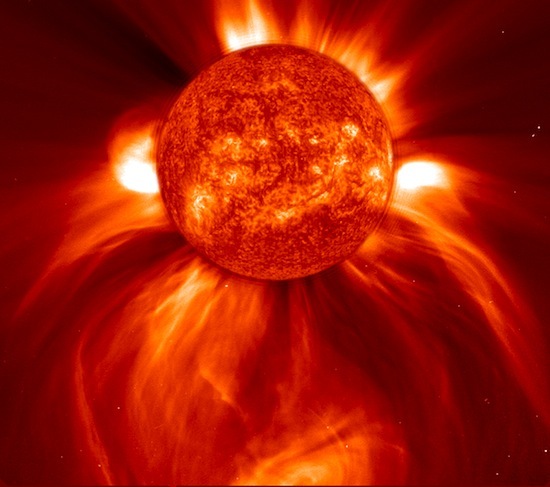 Virtually all of the considerations discussed here came after the fusion model of the Sun had emerged as a consensus of the scientific community. As noted, astronomers considered the most basic issue—the source of the Sun’s heat and light—to be fully resolved as we launched satellites and probes into space. Certainly, no one believed that a retroactive assessment of the fusion model would be necessary. And no one seemed to blink when the one and only quantitative argument for the Sun’s nuclear core failed, as the neutrino count came in at a third to a half of the theoretically required figure. When theorists propose a fundamentally new scientific perspective they are asking that it be considered as a useful starting point. A useful model will spell out proposed relationships between causes and effects. Causes are hypothesized and the claimed effects are named. A new model can then be generalized to see how well its underlying assumptions correlate with more detailed observations and a broader range of measurements bearing on the question. With increasing specialization in the sciences, the most costly mistakes will typically involve a failure to generalize the original argument, to weigh its predictive power within a sufficiently broad field of view. Carried out properly, this essential phase will throw a spotlight on weaknesses or outright failures of a theory, if they exist. This is where we look for contradictions, things that don’t fit the underlying assumptions. “Provably wrong if incorrect” is the ideal when stating a theory. In fact, the most useful models will be readily falsifiable, and the question of correlation between theory and observation can be explicitly tested against the full range of critical data. There can be no rational justification for short-circuiting this foundational phase. In the case at hand, where a theory affects how we see our celestial environment as a whole, the generalization of a qualitative argument is indispensable, requiring that the field of view be every bit as broad as the theory’s logical implications. A more narrow field of view will virtually guarantee that at least some falsifying observations, if they exist, will be ignored. In 1950, the Sun’s hypothesized “nuclear furnace” rested entirely on mathematical foundations. Virtually no evidential tests of the conjectured nuclear furnace were yet in hand. And the scientific mainstream was unaware of the plasma universe and the profound role of electric currents in space. Today, after decades of solar exploration, the accord between fact and theory that theorists had hoped for is gapingly absent. To see that this is so, it’s only necessary to review the stream of surprises arising from exploration of the Sun—a collective exclamation point to the gap between theory and observation. Nothing fit the original expectations. The original model did not anticipate, and was never able to explain, the spectacular acceleration of charged particles away from Sun. No one envisioned the “impossible” increase in temperature with distance upward from the solar surface, culminating in 2 million Kelvin at the solar corona. At the dawn of the space age, an electrified plasma torus around the Sun would have seemed quite ridiculous. Polar jets had never entered the imagination of solar theorists. Sunspot penumbrae were supposed to be convection currents, not electric current ropes guided by magnetic fields. And established dogma, exemplified in the work of mathematician Sydney Chapman, had categorically excluded the possibility that Earth’s auroras could be caused by electric currents from the Sun penetrating Earth’s upper atmosphere. The story yet to be announced is that more than 50 years of space age investigation produced only anti-correlations to the supposedly settled science of the Sun. [ 2 ] Hannes Alfvén, N. Herlofson,”Cosmic Radiation and Radio Stars,” Physical Review (1950), vol. 78, # 5, p. 616. [ 3 ] Wallace Thornhill and David Talbott, The Electric Universe (Mikamar Publishing, Portland, Oregon, 2007), pp. 55ff. [ 4 ] Eugene Newman Parker Conversations on Electric and Magnetic Fields in the Cosmos (Prineceton, 2007), p.1. [ 5 ] W. T. Sullivan, ed., The Early Years of Radio Astronomy: Reflections Fifty Years After Jansky’s Discovery (Cambridge University Press, 2005). [ 7 ] Anthony Peratt, Physics of the Plasma Universe (Springer-Verlag, 1992). [ 8 ] Eward S. Holden, Sir William Herschel: His Life and Works (New York, 1881), p. 212. [ 9 ] Hans Albrecht Bethe, Selected works of Hans A. Bethe: with commentary(World Scientific Publishing, Singapore, 1997), pp. 355ff. [ 10 ] Kyle Kirkland, Physical Sciences: Notable Research and Discoveries (New York, 2010), p. 1. [ 13 ] Ralph Juergens, “Reconciling Celestial Mechanics and Velikovskian Catastrophism,” Pensée, Fall, 1972. [ 14 ] Thornhill and Talbott, op.cit., pp. 53ff. [ 15 ] Donald E. Scott, The Electric Sky (Mikamar Publishing, Portland, 2006).